I would have to pick the dog. I have a one year-old golden retriever, named Casey, who I absolutely adore. I find that it's just so easy to love dogs. They are accessible, they are everywhere, they love people and they are easy to love back. I’m from Eastern North Carolina and I’ve lived in North Carolina most of my life. After receiving my Bachelors of Science degree from North Carolina State University, I worked for about a year at the NC State University Dairy Farm. The University has a dairy farm, beef farm, pigs, sheep, goats and horses for the undergraduate student labs and I visited the farms as an undergraduate. I found dairy cows fascinating and later got a job at the dairy farm and ever since, my focus as a vet has been Dairy Herd Health. 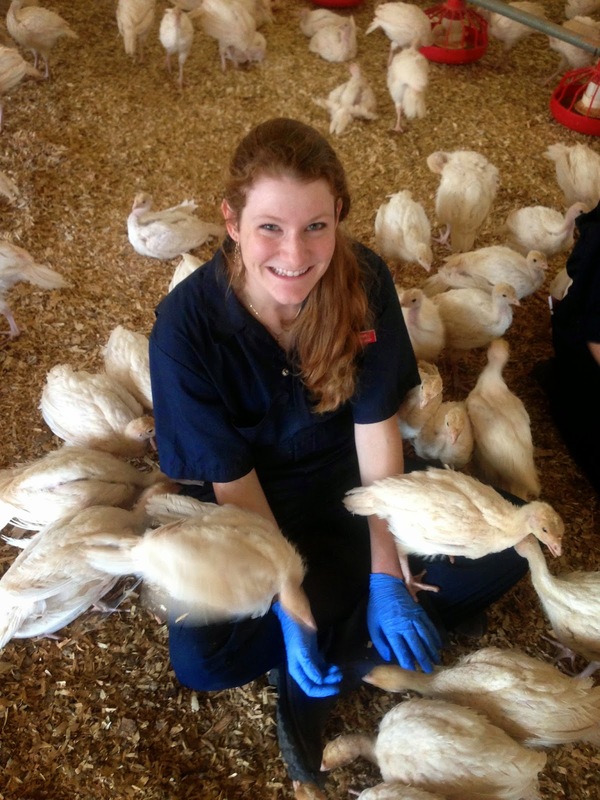 I did not grow up on a farm, so my family was quite surprised when I decided to study food animal health. When I’m not learning and studying farm animals, I try to make time for my personal hobbies, which include: yoga, hiking, and of course I take my dog to the park all the time. I also love to travel. This summer, I am in the Netherlands doing veterinary research through a veterinary scholars program. It may sound a bit cliché, but it was the first thing I said I wanted to be as I child, and I just followed that all of my life. Growing up and in high school, I developed a better understanding of health, medicine and problem solving and how all of those apply to the veterinary profession. I chose to attend North Carolina State University in Raleigh, NC because it is the only vet school in North Carolina (U.S.A.). What is it like to study veterinary medicine in the United States? Since being in Europe this summer I have had the opportunity to network with students from around the globe. And so far, I have learned that veterinary training in the United States is quite different from the rest of the world. In the United States, the typical pathway is an undergraduate degree, then a DVM. Some students work on PhDs or master degrees before or after the DVM as well. At my school, our first 3 years of vet school are in the classroom, and our 4th and final year is doing clinical rotations in the hospital. I am in a class of 100 and we will graduate in 4 years with a Doctorate of Veterinary Medicine degree. It seems a lot of European schools have 5-6 year veterinary programs that students are able to enter right out of high school. I understand it to be like a combined undergraduate/masters program, and they have more than one year on rotations. Training to be a vet can be a lot of hard work and requires serious dedication. Despite the hard work though, the most important thing I have learned is that when you are working on something you love, it’s always fun! What’s a cool "vet fact” or “vet tip” that you’ve learned? The best piece of advice I ever heard was from a veterinarian that I worked with. He was and old guy and ready to retire, but still very wise and passionate about veterinary medicine. He told me, “Make sure you have a hobby, something that will get you away from work and that can help you relax.” I always try to share this piece of advice with my friends and let them know that they should remember to make time for fun things. Whether it's music, service work, the outdoors, or travel, you have to make space for it in your life! It’s important to do things out of the routine to keep one’s sanity. My best advice for people considering becoming a vet is try to find the perfect balance between focused and flexible. It's important to be dedicated and stubborn, because there will be people along the way who won't believe in you and who won't support your plans. But you also have to be willing to accept changes and make modifications to your grand plan. If you had told me 10 years ago I would be studying food animal medicine, I would have never believed you. But because I took a chance on a slight interest I had a few years ago, I found my passion. So don't be so headstrong that you forget sometimes the wildest adventures come from being open minded and a willingness to try something new.